Turn the intelligent tester main switch on. 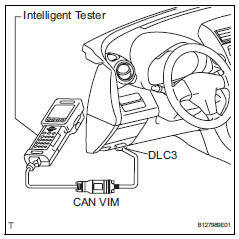 Select the menu items: diagnosis / enhanced obd ii / active test / vvt ctrl b1. Operate the ocv using the intelligent tester, and then check the engine speed. If the operation is not as specified, check the oil control valve, wire harness and ecm.